Thank you for what you do. When the student is ready, the teacher appears. I believe your teaching is exactly what I need! emotions into right understanding and love, in order to bring self-healing." thought provoking, and, most of all, highly useful and effective." "Would you mind talk to me for a while? I forgot my cell phone." We innately possess the ability to experience our world. Milky blue skies and the smell of a salty ocean; frosty beer, and a baby's giggles. 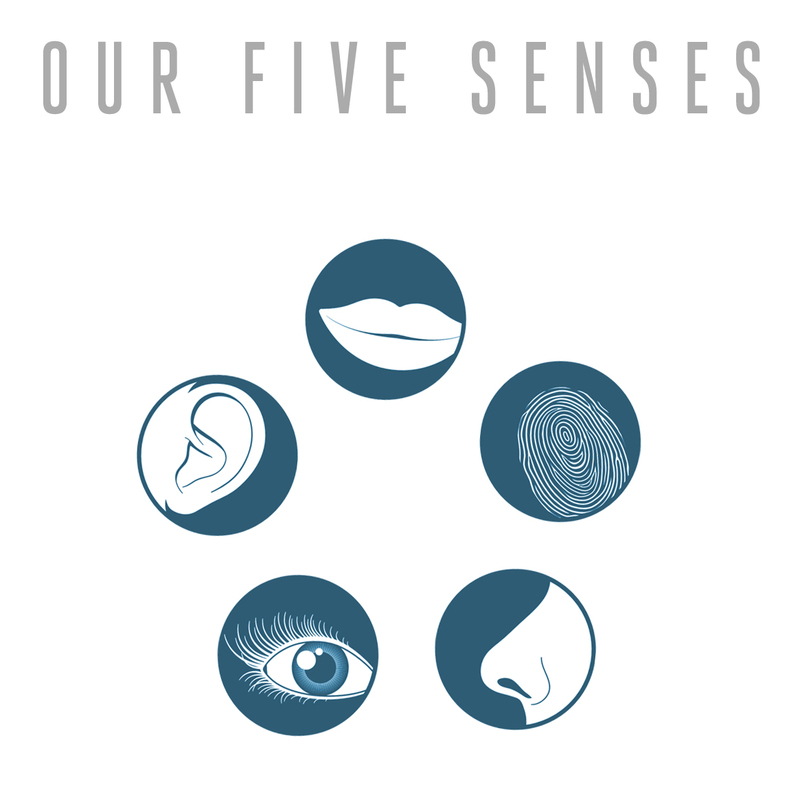 Without our five senses, we couldn't experience any of these. Sight, hearing, taste, smell, and touch are the doorways into the world of sensation. From subtle to overpowering, they help us perceive and process our environment. We are also all born with five tools to interact with the world. 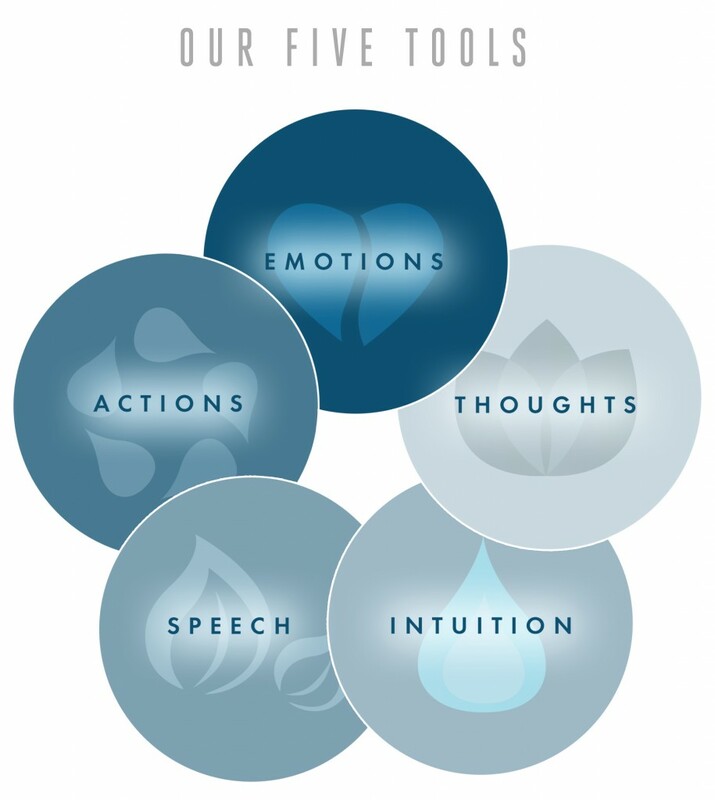 The five tools are our emotions, thoughts, intuition, speech, and actions. They are what we do with what comes in through our senses. With these five tools, we choose to express an emotion, ignore or consult our intuition, make a remark, or take action in line with what we're feeling. For the most part, we've been misusing these remarkable instruments to perpetuate sadness, anger, and fear. Now, we have the opportunity to learn to consciously and consistently use them to produce the emotions of joy, love, peace. In terms of insightful articles I've read, these three seem timely, especially if you're considering getting pregnant or holding in your emotions. In the first study, "boys with autism were three times more likely to have been exposed to antidepressants known as SSRIs in the womb than typically developing children, according to new research. The new study also found that boys whose mothers took SSRIs -- drugs including Celexa, Lexapro, Paxil, Prozac and Zoloft -- during pregnancy were also more likely to have developmental delays." The second article details the link between holding in your emotions and having a stroke. The article says that stress may "create changes in blood clotting." The writer's prescription for reducing stress is to simplify your life and focus on relaxing activities... Clearly, they haven't been introduced to Attitude Reconstruction, which advocates express one's emotions naturally, physically, and constructively to remove their destructive consequences on the level of the body, mind, and spirit. And the third graduation has gotten expensive. I hate to say it, but I'm getting old! We didn't have all those bells and whistles and what we did have didn't cost a couple of grand! On another front entirely, my dear friend Margaret Sweet, astrologist extraordinaire, is coming to Santa Barbara June 29 and 30th and will be offering insightful readings to give another perspective and guidance to your life. Check out her website and contact her at margaret@margaretsweet.com to set an appointment, in person or by telephone. The Hollyhock experience allows one to relax in comfort while experiencing one of the wildest, most pristine nature environments in the world. The grounds feature a large organic garden teaming with food and flowers, a gorgeous sandy beach, ocean view hot tubs open late enough to welcome the stars, a cozy lodge for gathering indoors at the fireside, and well-maintained paths in our 30 acres of surrounding forest. An ideal place to focus on yourself, we'll take care of the rest. Reasonably priced. Treat yourself to a great summer. Tools come in every shape and size. Each has a different purpose depending on the job at hand. You get to pick. I'll illustrate with an example... Here's a situation you might actually encounter: say you're marched into a conference room and told that your company is going to downsize. If you want to keep your job, you're going to have to move to another state. Your senses are heightened. You smell the musty room. You hear your boss's words. Your heart is pounding, and a wave of nausea rises in your stomach. How are you going to react? You can burst into tears, withdraw and zone out, become shell-shocked and despondent, or resist and counter-attack. You can tell yourself, "I knew this job was too good to last" or complain to your friends, "I'll never find another position with such good benefits." You can light up a cigarette, have a stiff drink, or decide not to show up to work the next day. Or, you can start thinking about a creative solution, ask copious questions, and make a plan. At every moment, you choose which tools to use and how you'll use them, destructively or constructively. The first tool, your emotions, is probably a bit of a new concept, but the healthy way to express these emotions is to emote, physically and constructively. That doesn't mean you get to poison a loved one with your venom. It means you allow the pure energetic sensation to move out of your body. What does that look like? It could involve crying, pounding, or shivering. You're just looking to release pent up emotions so you don't have an internal nuclear melt-down that burns you and the atmosphere, with toxic waste. Physically expressing your emotions in a healthy way is the fastest method to get rid of the energy and halt the destructive core attitudes. "This is the barn where we keep our feelings. If an emotion comes to you, bring it out here and lock it up." Thought is the second tool. You can stay in your old rut, or you can choose to replace your negative thoughts with new ones that are unequivocally true, such as "People are the way they are," or "We all make mistakes." You'll keep yourself from sinking when you repeat helpful thoughts, interrupting destructive chatter, and physically and correctly expressing emotions. I only half-jokingly tell clients that one hundred thousand repetitions will bring the new concepts into focus and offset all the times you've told yourself the contrary. Repeating constructive truths eventually works magic, even if it just feels like repeating formulas for calculus right now. Just be sure that you're focusing on something that contradicts the old and is indisputably true. The third tool is that nebulous thing called intuition. Consulting this well of wisdom allows you to tap into your heart and find what's indisputably true, at lightning speed. It's an unfailing guide for making sound decisions. Intuition helps with everything from simple things, such as what you really want for dinner, to the heavy hitters such as breaking up with your girlfriend of ten years. It's that sense of knowing in your gut about what's right, right now. For example, perhaps you know that even if your company downsizes and offers relocation 400 miles away as the only option, you can't leave your aging parents and move, no matter how lucrative the offer. Tool number four is your speech. The words and tone you use will either cause separation and fear or create connection and solutions. When you feel upset or off center, your communication skills can go out the window. What can be done to prevent this? Rather than accusing the company of being heartless, you can calmly talk about the implications this turn of events has for your situation. Finally, with your actions - the last tool in the box - you can counteract those worn out and harmful ways of behaving by taking little steps aligned with what you know will bring you toward more joy, love, and peace. In the example of the layoff there are several possibilities to consider: you might offer to take a cut in pay, put in applications at other firms, start checking the classified ads, or consider job retraining. I'm really not comfortable expressing my emotions. Does that mean Attitude Reconstruction isn't for me? No. You can move to the light side in a flash by using any one of the five tools. However, for maximum clarity, whenever you're stuck, cycle through all five. By first using emotions and thoughts (tools one and two) as a base, you can easily hear your intuition (tool three), which will reveal the truth you know within. Then it's easy to speak up and take action (tools four and five). As a result, feel the joy, love, and peace pour into your world. If you don't have the desire or time to emote (that is, to express your emotions physically), find freedom by aligning your thinking with what is constructive, or by pausing for a minute to consult your intuition. If you already know what you need to communicate, you can just speak up, as long as you abide by the Attitude Reconstruction rules for good communication. If a certain tool isn't working for you, go back around to an earlier one and take it from there.